Colombia may acquire a batch of Chilean Leopard 1V tanks, the daily La Segunda reported. Colombia has inquired into buying 60 tanks and sent technical teams to evaluate the equipment in October and December. Undersecretary of Defense Oscar Izurieta downplayed the possible deal, but confirmed Colombia is interested in acquiring some Leopards. There's more than just a transfer of tanks: Colombia has asked Chile for assistance in equipping and maintaining armored forces, La Segunda noted. As a quid pro quo, Chile's Army asked its Colombian counterparts for training on helicopter warfare in day and night conditions -- something in which Colombia has extensive experience after its long war against FARC. Chile plans to retire most if not all its Leopard 1V tanks, having equipped its front-line battalions with the more capable Leopard 2.Chile acquired the Leopard 1V tanks from surplus inventories in Holland and Germany. Most arrived in 1999. Reports that Chile would sell some Leopard 1V tanks to Ecuador never materialized. With Argentina and Britain increasing the rhetoric over the Falkland Islands, Chile is reviewing its diplomatic options and obligations to both nations. Chilean foreign relations officials are focusing in particular on navigation and travel accords after the Mercosur trading bloc -- which includes Argentina and Chile -- agreed in December to ban Falkland Islands-flagged ships from their ports. Chile's review includes a 1999 pact with Argentina that allowed Chile's Lan Airlines to resume flights to the Falklands. Chile has friendly relations with both Argentina and Britain, and the renewed tensions have put Chile in an awkward position. Faced with pressure from Buenos Aires, Chilean diplomats say it would be difficult to say no to Argentina, a trusted neighbor at a time when relations with Peru and Bolivia are frosty. Chile and Argentina have formed a joint peacekeeping force, for example. At the same time, Britain has been a solid ally of Chile, whose Armada likes to fancy itself after the Royal Navy. Argentina began its diplomatic charge for the Falklands in 2010, after Britain started drilling for oil around the islands (known to South Americans as Malvinas). The dispute is expected to heighten with this year's 30th anniversary of the 1982 Falklands War. 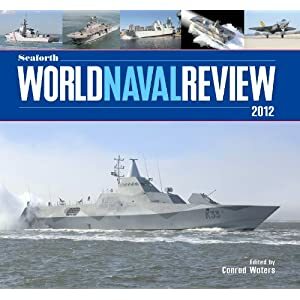 The 2012 edition of Seaforth World Naval Review has been released, and it includes a chapter on Chile's Navy written by the publisher of this blog. Thus, you see here a gratuitous promotion about this yearbook. World Naval Review "has rapidly established a reputation as an authoritative but affordable summary of all that has happened in the naval world in the previous twelve months," says the book's back cover. "It combines the standing features of regional surveys with one-off major articles on noteworthy new ships and other important developments." My chapter on the Chilean Navy details the modernization that started with Chile's purchase of two Scorpene submarines in 1997, to the refurbishment of the principal surface ships, to the recovery from the 2010 earthquake and the current upgrade of naval aviation and marine forces. It also discusses the looming changes in military budgeting and its impact on the Navy. The 2012 edition of this hardcover includes an analysis of today's Royal Navy, British offshore patrol vessels, plus chapters on sonar technology and naval aviation. Police in the volatile Araucania region received gunfire in a series of attacks that have escalated in the past several days. In the most serious attack, two officers were hurt by shotgun pellets during a confrontation with masked assailants Jan. 10. Earlier, a police vehicle and another carrying journalists also were hit by gunfire. In late December, an officer was shot in the arm as he escorted a logging company truck. Meanwhile, Mapuche leaders denounced police after a member of Carabineros scuffled with a woman holding a baby and aimed his weapon at her. The incident, captured on video, gave protesters evidence of excessive force Mapuches have been complaining about. Arson attacks have occurred in recent months too, as the conflict over ancestral lands shows no sign of abating. But it has not disintegrated into all-out chaos. Talks between government and Mapuche leaders continue, and the violence remains largely contained to certain hot spots. Still, it's a security problem Chile's leaders have yet to get under control. The Navy officially took ownership of a second-hand landing ship in December and is quickly moving to get the vessel in operating order. Already, at least two Cougar helicopters have been purchased from civilian operators and could serve as the airlift arm of the ship. The ex-French Foudre, rechristened Sargento Aldea, can operate up to three helicopters simultaneously and can accommodate up to seven similar-sized helicopters, including four in its hangar. Chile also bought from the French a tank landing vessel and two barges that can operate from the well deck. The 12,000-ton vessel (fully loaded) has a maximum speed of 20 knots and can sail 11,000 miles without refueling, assuming a normal cruise speed of 15 knots. Commissioned in 1990, the ship can carry a mechanized infantry battalion of 467 troops, making it Chile's principal force-projection asset. Naval-Technology.com has more details on capabilities and on-board equipment. As a relief ship, Sargento Aldea can load up to 1,600 people plus its crew of 224. It is ideal for disaster relief operations, thanks to a hospital suite that includes 51 beds, two operating rooms, a dental clinic, an X-ray room, a lab and even a burn unit. A single mission could have handled the recent evacuation of the volcano-stricken Chaiten community and could have carried the entire tonnage of the airlift that followed the 2010 earthquake. It is this type of civilian-friendly mission that makes acquisitions of multi-role ships politically attractive in just about any country. For Chile in particular, amphibious ships are essential because many isolated island and southern communities rely on the Navy for some basic services. The Sargento Aldea could be in a Chilean port as early as this month.